This morning I opened up my mail to this student question. Hi Doc, Lately I’ve been wondering if I have been practicing my art skills in the right way. I’ve been gesture drawing most every day and I try to sketch stuff out whenever I have an idea, but I guess I haven’t worked on a more complex project lately. The most recent thing I’ve done is a quick study on drawing the foot. I was just wondering if you knew some more ways that I could practice. I’m also wondering if you can tell me how I can see if I’m practicing bad habits. I would just like some of your advice! If you know of any other teachers I could ask about this, let me know. Thanks! Asking for critique is a PERFECT way to get better. You can ask me anytime and other teachers who draw in digital tools - I'd ask Luke and Dax. Also ask Bill. You can also form a community of critique with other students who want to improve. I would also copy anatomy a lot, which is what Christian recommended when he spoke to our school in the Lecture Series. Also there is a culture of critique for drawings on Deviant art. Sandbox is every Friday from 5-6 pm this term. Feel free to drop in. Every drawing teaches us something new. Drawing every day builds up your drawing skills. Rather than thinking of the "right" way think of the many ways in which you can create accurate or evocative drawings. Stepping back and viewing your drawing through a critical eye builds your observation and critical thinking skills as you move your drawing toward completion. 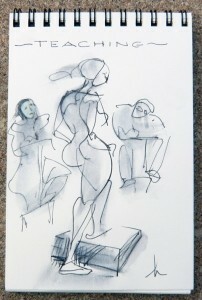 And each drawing experience lays the groundwork for a more confident next drawing. These can be established with loose scumbled line or with soft value and changed often as the drawing develops. Stepping back from your drawing early and often is an old fine art tradition that many digital drawers loose. One reason artists use easels is to easily move back from the work in progress. With digital tools you can make the whole image a small percentage every so often to see it as a whole. Pinching interfaces are great because you can pinch in and expand out in your view. Another tip which is easy in digital tools is to flip the drawing to mirror image every so often. Fine artists often use a mirror to check their work. Seeing the mirror image brings out problems with proportion, shape relationships, and value. Another tip is to work on a mid-tone background rather than white. We see the real world with background tones so it is more natural for the artist to bring lighter and darker values to an already toned environment. In addition to value, use color because it is also more the way we see the world. If I'm not happy with a drawing or several drawings I always switch medium. Drawing with the same medium can be frustrating if you are trying to achieve a look that is more easily achieved in another medium. Check our Ryan Woodward's book on Conte. He's a professional animator in love with Conte. You can get a box of conte in the school store and use it crisp for lively gestures like Ryan or smudged to achieve muscly chiaroscuro like Burne Hogarth.